Sometimes I enjoy hunting ingredients. I set aside part of day to drive around town from market to market to find just what I need for some recipes I’m planning to tackle. But, there are definitely times when the convenience of gathering what’s needed at one grocery store is necessary. If you’ve ever backed away from trying any Vietnamese recipes because of the challenge of an ingredient hunt, your worries are over. Andrea Nguyen’s new book, Vietnamese Food Any Day: Simple Recipes for True, Fresh Flavors , of which I received a review copy, shows you how to achieve great results with what you can find in any grocery store. This book was inspired by her mother’s resourcefulness when their family first arrived in the US in the 1970s. There weren’t nearly as many Asian products available in grocery stores then, and they had to make do with what they could find. They embraced learning about and becoming part of their new surroundings while continuing to honor Vietnamese culture. Today, many products you would need for Vietnamese dishes like fish sauce, rice noodles, and rice paper are available at most grocery stores. But, she offers some great ideas for substitutes for things that are more difficult to find. For example, if you can’t easily find tamarind, you can use pomegranate molasses for a similar tart flavor. She even includes a recipe to make your own from pomegranate juice. And, if the size of rice noodle you want isn’t on offer with other Asian products, try checking the options among the gluten-free pastas. The recipes cover all types of dishes from snacks to desserts, and I’ve been having fun trying several of them. First, I was excited about the Grilled Trout Rice Paper Rolls. I found brown rice paper and used it for the first time. I also had pretty, dark purple lettuce leaves that I brought home from Boggy Creek Farm and some homegrown cilantro and mint. The mixture was very pretty sitting on the rice paper before I rolled it up and realized that dark purple lettuce under brown rice paper was not photogenic at all. It was delicious, just not great for photos. And, the homemade Nuoc Cham Dipping Sauce was fantastic with the rolls. I also tried the Roasted Cauliflower “Wings.” They’re a vegan version of Chile Garlic Chicken Wings. Both recipes appear in the book. The cauliflower became incredibly crunchy after roasting with a rice flour coating, and the dipping sauce was addictive. The Gingery Greens and Shrimp Soup was a marvel. The flavor to effort ratio was unparalleled. Onion was cooked in oil with salt, fish sauce and water were added, and it was boiled for a few minutes. That alone created a flavorful broth for the soup. Incredibly fresh, chopped Swiss chard and snow peas from the farmstand cooked briefly with shrimp in the broth. This was one of the best soups I’ve ever made. In the book, there are also tempting rice and noodle dishes, chicken and fish dishes, egg and tofu dishes, and desserts like No-Churn Vietnamese Coffee Ice Cream that I can’t wait to try. 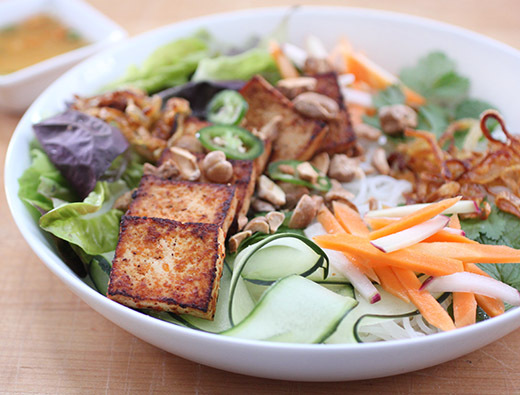 But, my next stop in the book was for the Rice Noodle Salad Bowl with Sriracha Tofu. There are notes throughout the recipes that offer suggestions for substitutions for some ingredients or ways of making the recipe vegetarian or vegan if it isn't already. The Rice Noodle Salad Bowl is topped with marinated and grilled beef or chicken, but the notes suggest topping it with Sriracha Tofu instead. That’s what I did. To make the tofu, it was first cut into domino-like pieces. In a skillet, water, soy sauce, and sriracha were combined. The tofu pieces were added, and it was cooked until bubbly. The tofu pieces were flipped, and when the liquid in the pan had evaporated a little oil was drizzled over the tofu. It was left to cook for a few minutes before being flipped once again. The tofu pieces took on an orange and brown color from the sauce. For the noodle bowl, rice noodles were cooked, and I found a brand that I really like shown in the photo below. I wanted to include some pickled vegetables and made a quick pickle from carrot and kohlrabi matchsticks. The toppings were prepped including crispy fried shallots, chopped cashews, lettuce leaves, cucumber ribbons, sliced chiles, cilantro, and mint. Homemade Nuoc Cham made with maple syrup, lime juice, water, rice vinegar, fish sauce, and chiles served as the dressing. The noodles, lettuce leaves, and vegetables were arranged in bowls. 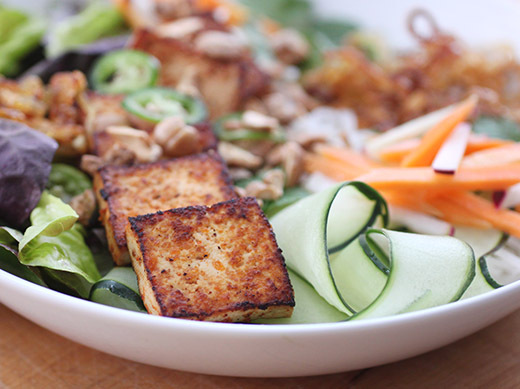 The chiles, cashews, and herbs were added on top, and the sriracha tofu was the crowning glory. The fresh flavors of all the vegetables with the simple, citrusy sauce makes for a light and lovely dish with great texture from the noodles. This way of cooking tofu is one I’ll be using often. 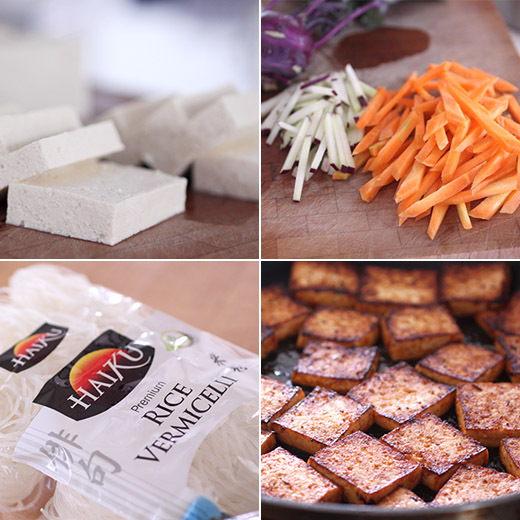 It’s a quick and easy process, and the tofu was delicious. I might not bother fitting this book onto the shelves just yet. There’s lots more I want to try as soon as I can. Let me begin by admitting that I have no skills whatsoever for decorating cakes. I need practice and patience. When it comes to baking cakes for occasions, I seem to run out of time for filling a pastry bag. But, I know I would enjoy it if I learned. Mostly, I want to bake cakes that taste delicious. Gesine Bullock-Prado is on the same page in that regard. In her latest book of which I received a review copy, Fantastical Cakes: Incredible Creations for the Baker in Anyone , she presents beautifully decorated cakes that are all about the flavor. She begins the introduction with a story about a cake decorating book she was fascinated with as a child. Looking back at the book later in life, she realized all those cakes were made with cake mixes and artificial dyes. So, she set out to create an ultimate book about decorating cakes made from scratch that would teach readers how to achieve great-looking and great-tasting results. And, as always, her humor shines through on every page. Knowing that depending on the convenience of a cake mix is handy, she even includes recipes for making your own dry mixes that can be stored and used as needed. There are explanations for different types of mixing methods that result in different textures. The paste method involves mixing the dry ingredients with fats to form a paste before adding the wet ingredients, and the result is a tender, tightly-crumbed cake. The creaming method is more common in which fats and sugar are creamed before dry ingredients are added. This results in a more stable cake for layering. 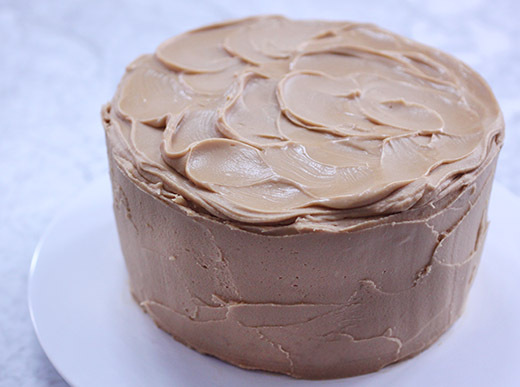 Last, the foam method is for cakes leavened by whipped eggs to make very airy cakes. The recipes include options for all these methods. There are then fillings, frostings, examples of combinations for incredible cakes, and tips and notes all along the way. Reading about the Salted Caramel Pastry Cream made me want to make it just to eat it from the bowl. Then, learning about Puppet Dust opened a door to decorating without piping frosting into swirls. It’s made from cake trimmings or crumbs or stuck bits from the pan, and it’s baked at a low temperature to dry the pieces before pureeing them into sand. The sand can be colored whatever shade is needed. In the book, cakes are simply frosted and chilled, strips of parchment are applied to the surface, and colored Puppet Dust is pressed into exposed areas of frosting to create a pattern. The Zebra Cake was made this way with pink stripes. There are so many show-stopping cakes and brilliant ideas. There’s a Swiss Roll Sponge with a pretty baked-in pattern of cherries on the stem that cover the outside, and that’s a technique I have to try too. And, the Apple Cider Cake has filled cream puffs layered inside the cake and adorning the top as well. There’s a lot to experiment with here. As I read the book, Kurt’s birthday was fast approaching. 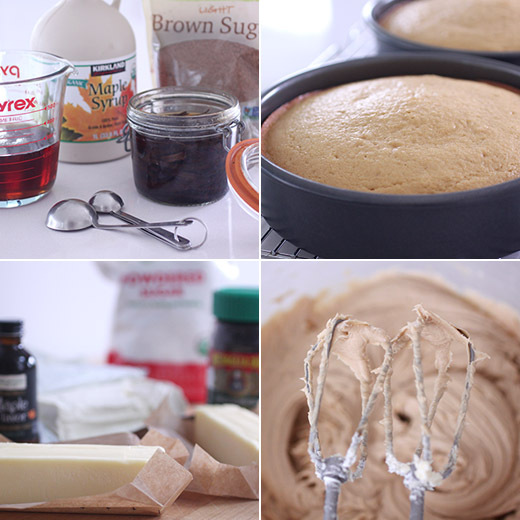 I suspected he would like the idea of a maple cake, and I liked the idea of trying the paste method of mixing. I think I had made a cake this way once before, but it had been ages. The recipe calls for maple sugar or maple syrup. Sadly, maple sugar is exorbitantly expensive here. I went with maple syrup. To start, brown sugar, flour, baking powder, and salt were added to the mixing bowl. Room temperature butter was added and mixed until sandy. Eggs were added followed by the maple syrup, maple extract, and vanilla. Last, milk was added and incorporated. I baked the layers in eight-inch pans, and there are specific instructions in the book for prepping pans before baking. There’s also a tip about wrapping and freezing cake layers and filling and frosting directly from the freezer. Firm, frozen cake layers are easy to work with, and the cold temperature helps to set the filling and frosting as you work. I baked my cake layers a couple of days in advance and froze them before filling and frosting. 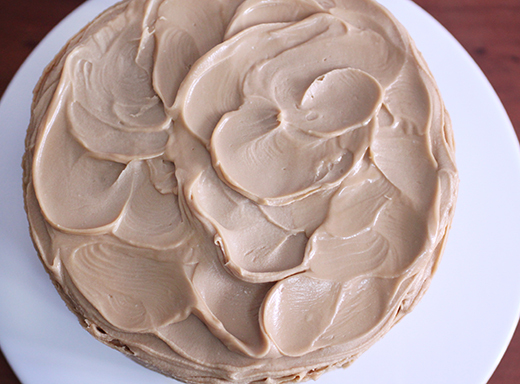 What really drew me to the maple cake was the idea of topping it with Maple Espresso Cream Cheese Frosting. In the book, it’s suggested that Instant ClearJel be added to cream cheese frosting to make it set better. Since I wasn’t transporting this cake, I skipped it. Also, since the layers were frozen, the frosting set while being applied. It was a mix of confectioners’ sugar, butter, cream cheese, vanilla, maple extract, maple syrup, and espresso powder. I loved that the recipe made an ample amount to generously fill between layers and cover the outside well. I separated the frosting into two bowls and used one for the crumb coat and the other for the final coat. I always fall for cream cheese frosting, but this was hands-down my favorite frosting ever. Espresso and maple make perfect partners. With all the options in this book for filling, topping, adorning, and sprinkling cakes, I’m very inspired to take my cake decorating to the next level. I might still shy away from the piping bag, but puppet dust is definitely in my future. Back in 2011, I attended a class at the Central Market Cooking School taught by Daniel Olivella. It was a seafood-focused class, and I fondly remember the octopus dish with potatoes and smoked paprika. I also remember the paella and learning about Bomba rice, and I remember the Xato salad. Chef Olivella told us about the popularity of this salad in Catalonia. There’s a competition every winter among towns to see who makes the best version. It’s a salt cod salad with a dressing made with Romesco sauce, but I’ll get to more of the specifics of it shortly. 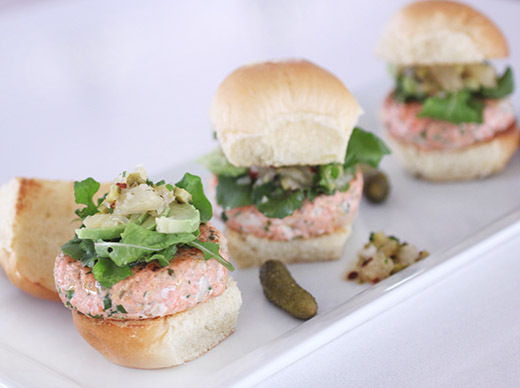 At the time of that class, Chef Olivella was operating a Spanish tapas restaurant in Oakland. He mentioned that he’d like to open a restaurant in Austin and was considering it. Soon thereafter, Barlata changed its address from California to Texas, and Austin had a new tapas restaurant. And now, recipes from the Austin restaurant and from Olivella’s upbringing in Spain can be found in the new book Catalan Food: Culture and Flavors from the Mediterranean of which I received a review copy. The chapters cover everything from starters to desserts with vegetables, rice and noodle dishes, seafood, and meat. It’s some of the simplest dishes that really got my attention. The Wrinkly Potatoes are cooked in an abundance of salt before being halved and served with allioli, and they look completely irresistible. The Biquini Mallorque is a grilled cheese sandwich made with Manchego cheese, but the twist is the addition of Romesco sauce and sausage—and cooking the sandwiches in olive oil. I made some with just the cheese and Romesco, and it’s my new favorite grilled cheese. The Warm Octopus with Potatoes dish from the class is in the book, and I can’t wait to revisit it. There’s also a Chicken with Shrimp dish made with an almond and hazelnut picada with sherry that’s on my to-try list. And, despite the churros, doughnuts, and Crema Catalana in the desserts chapter, my first stop there was for the Chocolate-Covered Marcona Almonds. That’s such a good combination with the roasted, salted nuts. Then, I flipped back to the page with the salt cod salad. 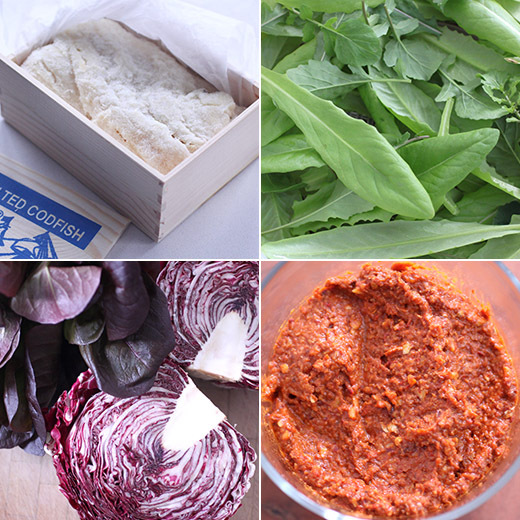 The main elements are the big flakes of salt cod and the dressing made with a mix of Romesco sauce, olive oil, and sherry vinegar. I still have my recipe list and notes from the cooking class, and I see that the version made that night included a black olive puree and no salad greens. So, there are options for how to proceed, but I mostly followed the instructions in the book. Something I learned about Xato from the book is that frisee is the salad green of choice for it. This makes sense since frisee is a sturdy salad green, and the dressing is on the thicker side. The day I planned to make it, frisee wasn’t available at the farm stand I visit every week or even at the grocery store. 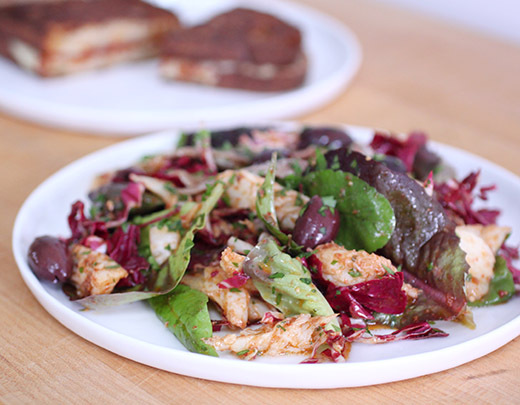 I used a mix of local salad greens and radicchio instead. I started by making the Romesco sauce. I can never locate nora chiles and used anchos instead. They were stemmed and seeded and rehydrated in boiling water. Tomatoes were broiled until charred, and almonds were toasted. Bread was fried in olive oil, allowed to cool and cut into small pieces. Then, the garlic was cooked in the olive oil. I pureed everything in a food processor with some sherry vinegar. Some of the finished Romesco was whisked with olive oil and more vinegar to create the dressing. The salt cod had been soaking for a day in the refrigerator. I drained it and broke it into chunks. 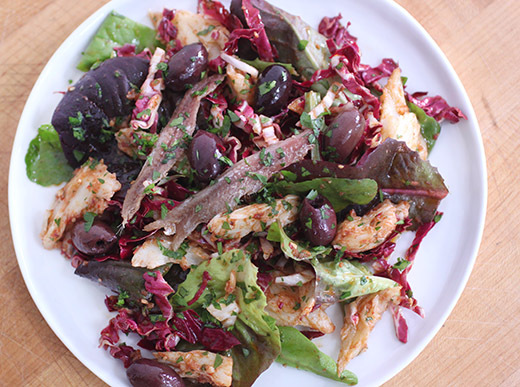 The mixed greens were tossed with the dressing and placed on plates before being topped with salt cod chunks, black olives, anchovies, and chopped herbs. 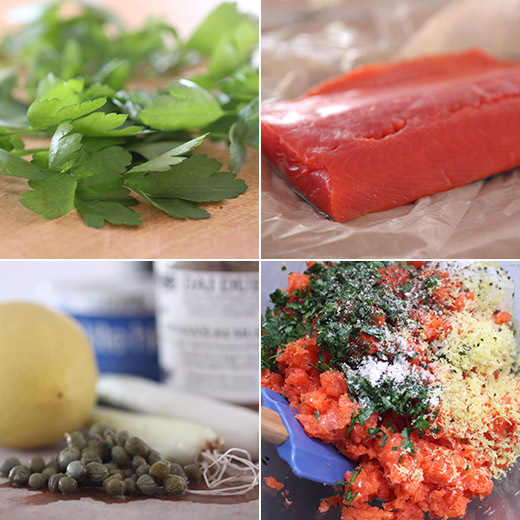 Canned tuna is also listed among the ingredients in the book, but I skipped it and added extra salt cod. I made a meal out of this salad with lots of salt cod on each serving. There are a lot of big flavors going on in this mix of ingredients, but they all go together well. I also served the Manchego and Romesco grilled cheese sandwiches on the side, and those are so good after browning in olive oil. It’s easy to make meals from the snacks and salads in this book, and eating Catalan food is never disappointing. One of the best consequences of writing this blog for about 11 years is the number of fellow food bloggers I’ve met in real life and online. In my very early days of food blogging, I encountered Jamie Schler’s lovely blog, Life’s a Feast. I always loved to see what she was baking each time I visited, and I was inspired by her adventures with macarons. We visited each other’s sites and got to know one another through blog posts and comments. 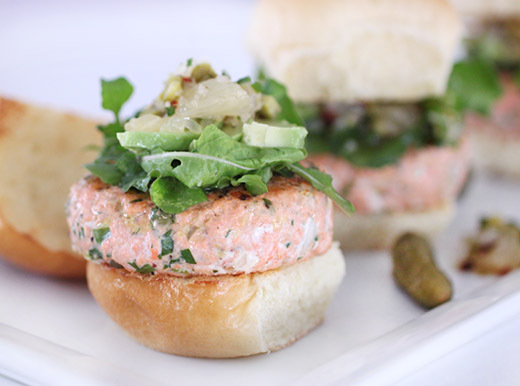 I’m so proud to now be blogging about her first cookbook, Orange Appeal: Savory and Sweet . Congratulations to Jamie! Because she’s a native of Florida, it’s fitting that she’s brought us a collection of recipes focused on oranges. Of course, she now lives in France and notes in the book that she wanted these recipes to be very usable no matter where the reader resides. The ingredients used are all common enough to be found just about anywhere. And, the variety of recipes includes sweet and savory, starters and mains, and sauces and relishes. I’ve been having fun trying some things from the book while citrus season is upon us. The first recipe I tried was the Orange, Date, and Pecan Muffins. They are deliciously sweetened with chopped dates, honey, and maple syrup and no refined sugar. Chestnut flour is called for, but there is a note that all-purpose can be substituted. As luck would have it, I had some chestnut flour among my stash of various flours and grains and was delighted to use it. I’ll be turning back to this recipe often. There’s an intriguing recipe in the first chapter for Orange Avocado Salad Dressing or Dip. You begin by making a homemade mayonnaise and then add mashed avocado, orange and lime juice, chipotle powder, and cilantro. It sounds perfect for dipping fresh vegetables or using as a sauce for seafood or mixing into salad greens, and I’d like to always have a bowl of it in my refrigerator. The Savory Orange, Onion, and Olive Focaccia also caught my eye. What a great combination of flavors for a savory bread. And, the sweets all sound irresistible. There’s a Glazed Blood Orange Yogurt Loaf Cake, the Orange Panna Cotta with Orange Compote, and Orange Curd Tartlets in a Coconut Pastry Crust that also appear on the book cover. Despite all the cravings of my sweet tooth, the next dish I made was the Pea and Shitake Orange Risotto. To start, the shitakes were sauteed in butter and olive oil and then glazed with some orange juice before being removed from the pan and set aside. Next, minced onion was sauteed before the Arborio rice was added and toasted. I used a homemade vegetable stock, and I actually enjoy the process of making risotto. 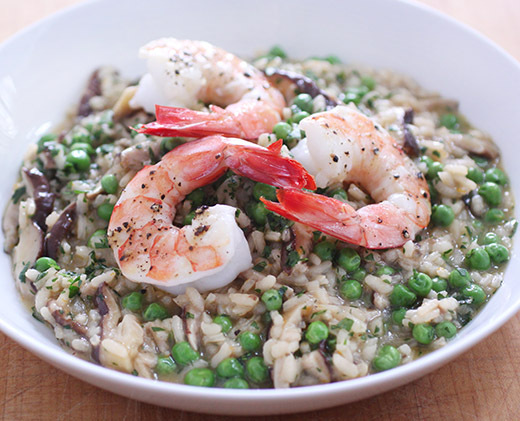 I remember the first time I ever made risotto and how I was re-reading the recipe as I cooked and stirred and watched the clock closely to check the timing. It seems so easy now. You don’t really need to check the clock at all. You can see when the rice has absorbed the stock, and you add more. And, you keep stirring. But, you can stir with one hand and sip wine with the other. 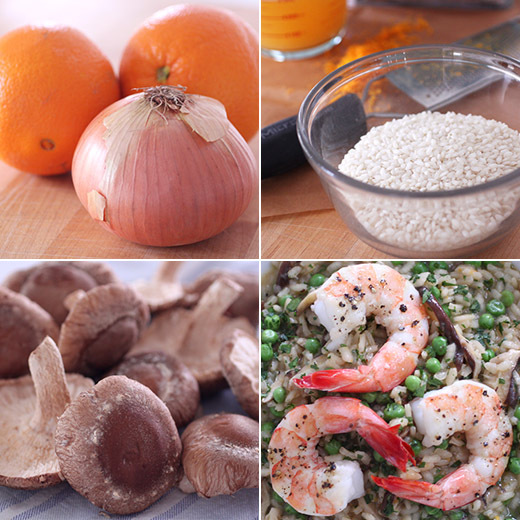 For this risotto, after the rice was cooked, more orange juice was added and incorporated. Then, frozen peas were added with the cooked shitakes. I added lots of chopped parsley from my garden. I served it with some roasted shrimp on top. The orange flavor with the shitakes and peas was a fantastic combination. 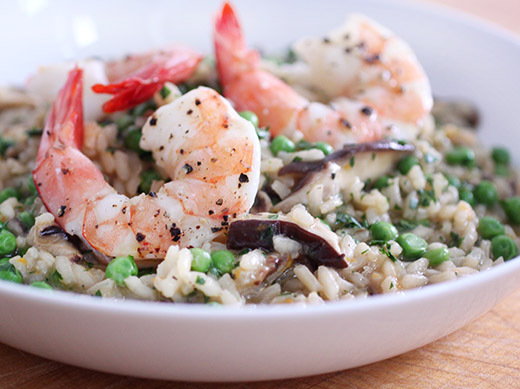 I’m so happy to have some of this leftover risotto in my freezer. I’m planning to make arancini stuffed with fresh mozzarella. For even more decadence, those little crispy arancini would be great with the Orange Avocado Dip. Then, I’m going to have to stock up on blood oranges before the season ends. I have more cooking with citrus to do. Of course, I’ve always liked pie. It’s so versatile. With the various fillings and crust options, sweet and savory directions to take, and the endless ways to top a pie, I don’t think it’s possible to not like pie. But, suddenly, I’m an even bigger fan of pie than I already was. I recently read a review copy of Cathy Barrow’s Pie Squared: Irresistibly Easy Sweet & Savory Slab Pies , and now I find myself wanting pie for every meal. The book is devoted to rectangular pies which are bigger and a little easier to cut and serve than round pies. All the recipes are written to fit a quarter sheet pan. Regardless of the size and shape of the pies though, the recipes themselves kept me turning the pages. I really do want to make all of these pies. After a thorough introduction to working with dough and ideas for lattice or cut-out tops, there are recipes for all the different crust options ranging from an All-Butter Crust to Cookie Crumb Crusts and a Hash Brown Crust to name a few. That last one got my attention. There are also sweet and savory toppings like Cacio e Pepe Savory Streusel and Baby Biscuits. Then, the pie recipes themselves begin with a savory chapter. The Nacho Slab Pie with a Cornbread Crust is sure to be in my near future as is the Pan-Roasted Mushroom and Kale Slab Pie with an All-Butter Crust. I won’t let the summer pass without trying the Southern-Style Tomato Slab Pie with a Cheddar Cheese Crust. There’s a classic Chicken Pot Slab Pie and a Curried Chicken Slab Pie. I can’t decide which to try first. And, the chapter full of sweet pies is just as fun. The Frosted Strawberry Slab Pie with a Cream Cheese Crust looks like a giant pop-tart complete with sprinkles. Every fruit is shown in a pie, and there are cream pies as well. I know I’ll soon be baking the Sugar-Free Fig Slab Pie with a Cream Cheese Crust because it looks delicious with the pureed fig and orange filling and zero sugar in the recipe. But, let’s back up to that Hash Brown Crust. At the end of each of the pie recipes, there is a list of swaps. 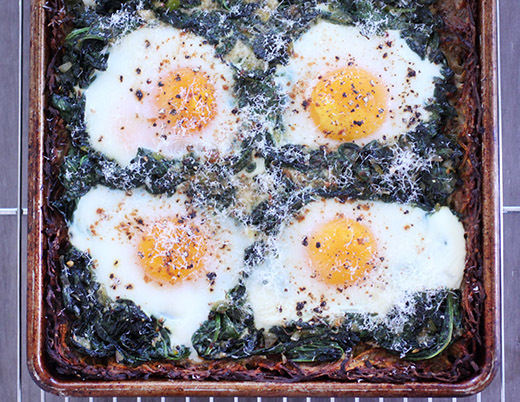 For this Eggs Florentine Slab Pie, one suggestion is to use half sweet potatoes and half russets in the crust. As if I wasn’t already convinced to try this pie, that sealed the deal. I should mention that bacon is an ingredient in the recipe in the book, and I skipped right over it. I started by grating onion on the small holes of a box grater. I used a mix of local sweet potatoes, new potatoes, and a russet. They were grated and squeezed to remove as much liquid as possible before being added to a bowl with the onion. The liquid was squeezed into a bowl and left to sit. The liquid was poured off, and the potato starch collected in the bottom of the bowl was added to the grated potatoes and onion. Eggs and salt were added and mixed to combine. I brushed olive oil on the baking sheet, and pressed the potato mixture into the pan. The surface of the potato mixture was brushed with more oil before baking. For the filling, I used some fresh, local spinach that I washed and sauteed with minced local leeks. I added some creme fraiche that I had on hand and then layered it over the baked potato crust. I created open spaces for the eggs and cracked jumbo eggs on top. The pie went back into the oven until the eggs were set. It was sprinkled with grated parmesan before serving. This was a hearty brunch dish with the potato crust and its crispy edges. I wished that my spinach layer had been a bit thicker to hold the eggs in place a little better, and that’s because I might have had a bit less spinach that called for in the recipe. I’ll use more next time. Or, I might try a different filling for the potato crust. Or, I might try several other pies from the book first. One thing is for sure, I’ll be making more pies. Sometime in the 1980s, I developed a deep and abiding love for eggs Florentine: It’s the creamy spinach stirred together with a runny egg yolk. That sumptuous mixture was precisely the inspiration for this breakfast pie. It’s what you want on a snowy morning—slightly wobbly coddled eggs basted with cream in a delicious roasted potato crust whose scent means carrying the pie from oven to table is a moment worthy of everyone’s attention. Because nearly everyone likes bacon, scatter crispy bits across the top. All that, and it’s gluten-free, too. Do not use a convection oven as a breeze wafting over the eggs results in a weird, rubbery texture. Heat the oven to 350 degrees F. Scatter the bacon across the slab pie pan, and bake for 15 to 20 minutes, until crispy. With a slotted spoon, transfer the bacon to a paper towel–lined plate and drain. Do not dispose of the bacon fat, but pour some into a small bowl and leave the rest in the pan. Increase the oven temperature to 425 degrees F; if you have one, place a baking stone, Baking Steel, or inverted baking sheet on the center rack to heat. For the crust: Grate the onion on the medium holes of a box grater or a food processor’s grating disk (my preference). Place the onions in a medium mixing bowl. Grate the potatoes on the large holes side of the box grater, and, taking a handful at a time, squeeze the shreds over a small bowl. As each handful is squeezed, place in the bowl with the onions. Continue until all the potatoes have been grated and their liquid squeezed out. Work quickly to keep the potatoes from turning brown. You should have about 4 cups of dry-ish potatoes in the end. For the filling: Use your hands (or a colander and a firm wooden spoon) to squeeze the liquid out of the spinach. 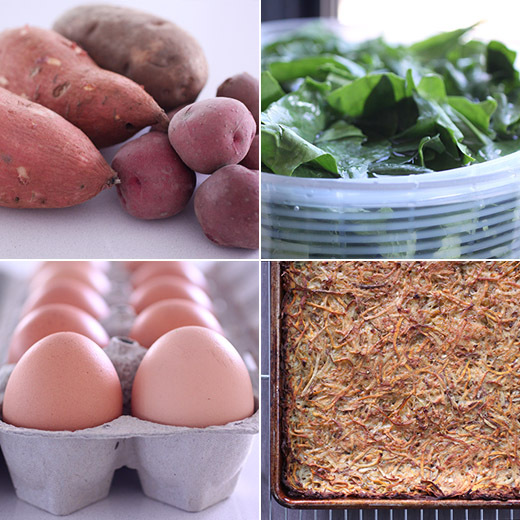 The drier the spinach, the less time is required to cook it, which keeps the flavor fresh and green and not metallic. In a large, wide sauté pan, melt the butter over medium heat until frothy. Add the diced onions and cook until translucent, about 7 minutes. Turn up the heat, add the spinach, and cook until the mixture is nearly dry, another 5 to 7 minutes. Grate nutmeg over the spinach and add the cream, salt, and pepper. Cook, stirring over medium heat, until slightly thickened, 5 to 7 minutes more. When the potato crust is baked and all crispy and browned, spread the spinach filling thickly over the top. Use the bottom of a ladle to form 8 wells in the spinach mixture and crack an egg into each divot. Spoon a tablespoon of cream over each egg. Scatter the crispy bacon bits all across the pie. 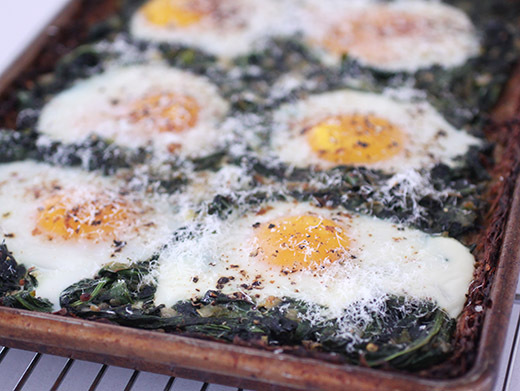 Slip the pan back in the oven and bake for 12 to 15 minutes, until the eggs’ whites are cooked through. Remove the pan from the oven and sprinkle with the Pecorino and chives. Serve right away. Happy New Year! I hope your holiday season was delightful. I have a few sweet treats from my holidays to share today. For a Christmas dessert, I wanted to make use of my homegrown Meyer lemons but of course couldn’t decide what to make. I mulled it over for days and flipped through several books while considering various cakes, tarts, and frozen desserts. Then, I pulled Baked: New Frontiers in Baking off the shelf, found the little lemon-almond meringue tartlets, and wondered how I’d ever forgotten this recipe from this book. It was just what I wanted to make. 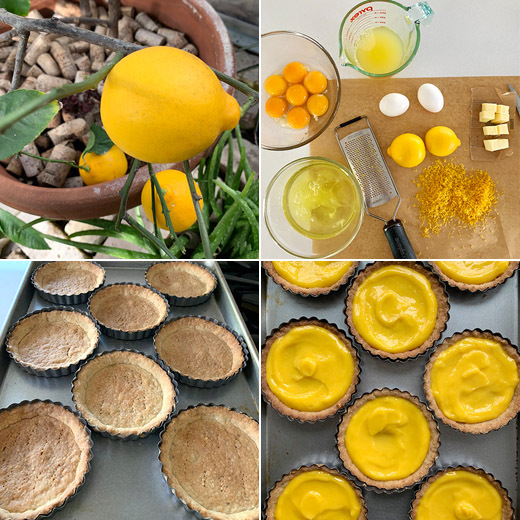 They’re cute, individual-sized tartlets with a tangy lemon filling, and the pastry for the tartlet shells was made with an interesting twist. Amaretti cookies were ground and added to the flour in the dough. Amaretto liqueur is also suggested, but I used almond extract instead. Some years are better than others for my lemon trees, but I had plenty of lemons for the curd. I was amazed by the dark yellow color the Meyer lemons gave it, and the flavor was divine. For the fluffy meringue topping, I remembered from recently reading BraveTart: Iconic American Desserts a recipe guaranteed to not weep or collapse over time. I planned to make several tartlets and serve them over the course of a few days. So, I followed the instructions for that magical Marshmallow Meringue which involves heating the egg whites and sugar to 175 degrees F before whipping. Some almond extract was added to the meringue as well. 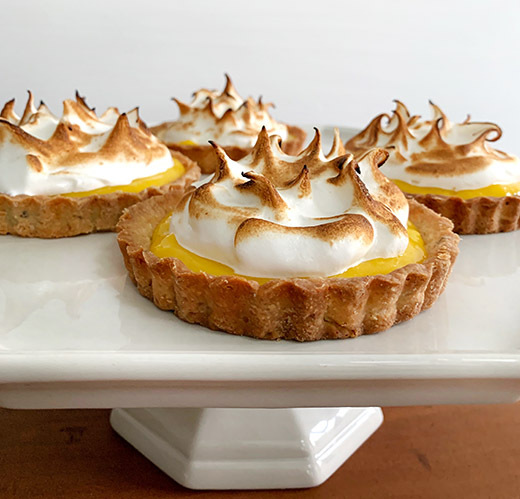 I piled the meringue high on each tartlet and toasted it with a kitchen torch. I can report the meringue performed perfectly and did not weep at all even after leftover tartlets had been refrigerated for three days. The combined result was everything I hoped it would be. 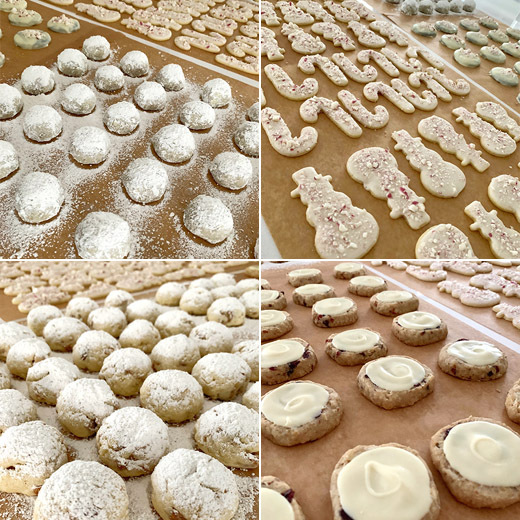 As usual, I baked possibly as many cookies as Mrs. Claus this year. I returned to a couple of favorite recipes and also tried two new ones. I made my favorite sugar cookie dough for rolled and cut cookies. I decorated them with royal icing and crushed candy canes. I used half of the sugar cookie dough to revisit the Hawaiian Snowballs recipe. This is a favorite cookie of mine with the chopped, dried pineapple and macadamia nuts in the dough. I also made white chocolate-covered Chocolate Peppermint Cookies again. As a big fan of white chocolate and mint, I think these are even better than thin mints. One of the new recipes I tried this year was Chai Snowballs from Martha Stewart Living, and they will definitely be making a repeat appearance. The other new recipe was Cranberry-Oat-Almond Shortbread topped with white chocolate from Sweet: Desserts from London's Ottolenghi . Rather than rolling out the dough and cutting these as suggested in the book, I made two logs of dough and sliced and baked. This recipe was also a keeper. I try to give away as many cookies as possible, but I do have to taste to make sure everything turns out ok, right? After all of that delicious sugar, I’ll be skipping dessert for a bit, but I don’t regret one bite.